READ BY PETER MANDELSON. The hotly anticipated memoir of one of New Labour's three founding architects. READ BY PETER MANDELSON. Peter Mandelson is one of the most influential politicians of modern times. 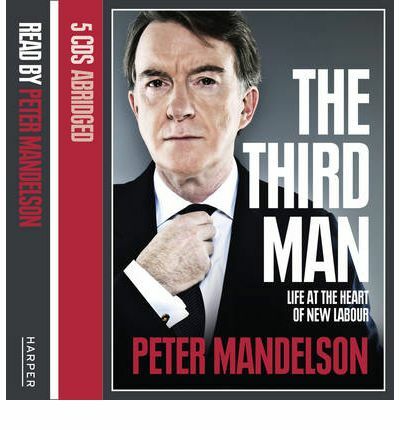 The Third Man is his story -- of a life played out in the backroom and then on the frontline of the Labour Party during its unprecedented three terms in government. Much of the book is devoted to the defining political relationships of Peter Mandelson's life -- with Tony Blair and Gordon Brown. Charting what he terms the 'soap-opera' years of the Labour government, his book is certain to ruffle many feathers. Forced to resign from Cabinet twice in three years, Peter Mandelson has cut a divisive figure through British politics but his time as Secretary of State for Northern Ireland gained him many supporters. He was a highly regarded European Commissioner before being brought back into British politics by Gordon Brown in 2008 to serve as Secretary of State for Business, Innovation and Skills, and as First Secretary. Containing a mixture of autobiography, personal reflection and political history, The Third Man draws heavily on detailed diary notes that Peter Mandelson took during the events, discussions and meetings that shaped the government and the Labour Party over 25 years. He began writing the book while serving as European Commissioner, and has been completing it since leaving office in May. Much has been written about Peter Mandelson as the person at the heart of the New Labour project but this is the first time we have heard the unvarnished truth from the man himself. The Third Man is set to become the most talked about political memoir of the year.